This earrings and necklace set are original acrylic miniature paintings on wood with a clear polyurethane finish. 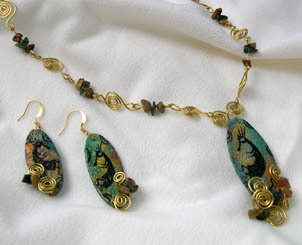 The chain is hand crafted with gold plated wire, Jasper and Agate rock chips and measure 20 inches. The earrings have gold plated French hooks for pierced ears and measure 1 ½ inches. The back of each earring and the necklace has been painted, signed and dated by the artist.